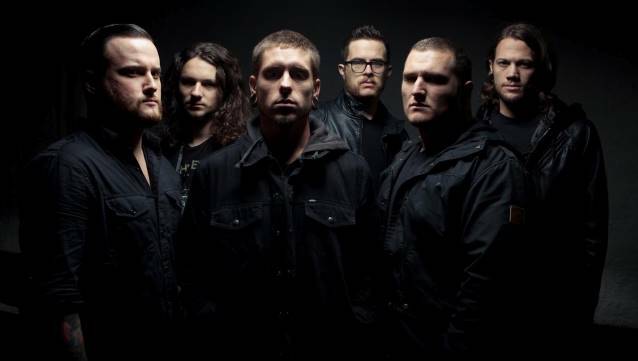 On October 15, Sergio Cesario of Metal Master Kingdom conducted an interview with guitarist Zach Householder of Knoxville, Tennessee death metallers WHITECHAPEL. You can now listen to the chat in the YouTube clip below. The remastered version of WHITECHAPEL's debut album, "The Somatic Defilment", came out in April. The band placed the CD in the capable hands of Audiohammer Studios producer Mark Lewis (THE BLACK DAHLIA MURDER, DEVILDRIVER) for a complete remix, along with a remaster by Alan Douches. The results are staggering and give "The Somatic Defilement" a modern luster up to the standards of the band's most recent recordings. WHITECHAPEL is currently on the road with GWAR, IRON REAGAN and A BAND OF ORCS. The self-titled album from WHITECHAPEL was released in June 2012 via Metal Blade Records. The CD was engineered and mixed by Mark Lewis, who also handled production duties alongside the band. The artwork was created by Aaron Marsh of Forefathers Group with art direction provided by WHITECHAPEL.